Home » Health Care » How Much Juice Is In A Lemon? 4.1. What about the benefits of lemon water? In this article, you will find some ways to identify how much juice is in a lemon and some recommendations for measuring the number of lemon fruits you need to prepare for your cooking effectively. When reading most of the cooking recipes, it is typically shown that there is about ½ cup or 3 tablespoons of lemon juice. However, with the amount of liquid, how many lemons you will need to buy? In order to prepare enough lemons for completing your cooking, there is one question need to be answered: how much juice is in a lemon? The fact is that some lemons can be very juicy, while others are not. In addition, different sizes of lemon can lead to the different amount of juice in one lemon. Then, please be noted that a wide range of methods mentioned in this article for the purpose of answering the question, “How much juice is in a lemon?” is impossible to be 100 percent exactly. However, it is expected to provide you some recommendations for measuring the number of lemon fruits you need to prepare for your cooking effectively. It is estimated that the average size of lemon fruit is weight from 3.4 to 3.6 ounces through different test samples. Then, it will lead to this conclusion: there are from 4 to 5 lemons in one pound. On average, it is assumed that one lemon, from 4 to 5 of which are made one pound will provide about two tablespoons of lemon juice. In addition, this lemon will also provide about one tablespoon of lemon zest . Therefore, if your cooking recipe has called for four tablespoons of lemon juice, then you will need about two lemon fruits in order to prepare for the recipe. So, the point we want to provide you here is that one lemon will provide about two tablespoons of lemon juice and one tablespoon of lemon zest. It is noted that from 4 to 5 lemon juice will weight one pound appropriately. There are two tablespoons of lemon juice in a lemon, and there are about 15 ml of each tablespoon of lemon juice. Furthermore, you may wonder whether the color of lemon has any impact on how much juice is in a lemon. It is believed that it has very little influence on the result which will not contribute to a significant change of your cooking. Here is a bonus information for you. Most of the people think that the changing of color which has happened to lemon is because it is ripe. However, it is certainly not. Do you know the fact that lemon tree has been an evergreen tree? It is the lemon that has changed from green color to yellow color due to the changing of temperature, but for the ripeness. In addition, most of the lemons have originated from Asia, particularly in the Northeast India as well as North Burma and China . However, in case you have lemon with a larger size than that of the average. As mentioned above, it is assumed that one lemon, from 4 to 5 of which will make up one pound, has consisted of two tablespoons of lemon juice as well as one tablespoon of lemon zest. For instance, if I have some lemons, from only 2 to 3 of which have already made up one pound, what will I do? Does the recipe mentioned above still work in this case? It may not. That is the reason why in this article we have prepared for you a better solution in order to answer more effectively for the question of How much juice is in a lemon? In order to calculate juice of one lemon, all you need to do is adding how much lemon juice you need as well as lemon zest in demand. This automatic formula will provide you how many lemon fruits you will need to prepare in order to get these mentioned lemon juice amount. Below is the link for you to get the automatic formula for answering the question of how much lemon juice is in one lemon? From the link mentioned, you will see the automatic formula as above. All you need to do is provide your amount of lemon juice in need. There are only two things that you need to provide for the automatic formula to work. The specific number and the unit of lemon juice you want to. From the picture which is shown above, it is set the unit as the tablespoon. For instance, I need six tablespoons of lemon juice, how many lemon fruits will I need to prepare. This automatic formula will provide you the result by your clicking at the button named “Calculate”. Most of the time, you will see there are mentions of a 1/4 cup or 1/8 cup in the recipe. So, you may wonder how many tablespoons in a 1/4 cup, or how many tablespoons in a 1/8 cup? For your information, one US tablespoon is equal to 1/16 US customary cup, which means there are four tablespoons in a 1/4 cup and two tablespoons in a 1/8 cup. Besides how much juice is in a lemon, if you also want to answer the question of how much zest is in a lemon, this automatic formula can also help you. All you need to do is change your requirement from lemon juice to lemon zest and leave the rest of calculating for the automatic calculation. If you feel some inconvenience when going to a website link in order to search for the result of how much lemon juice is in a lemon, then why don’t you put the answer in your pocket? This is also the third method we suggest for answering the question of how much juice is in a lemon. How to do that? It is truly simple through the download and usage of some mobile apps which are named Produce Converter. Fortunately, these apps have been available in both Android marketplace and iTunes store for any cell phone which you are using. If you are going to cook following a specific recipe which has required five tablespoons of lemon juice, for instance, just open the app on your cell phone named Produce Converter and get the result of how many lemon fruits you will need to prepare. In addition, apart from acting as the lemon juice conversion, the apps named Produce Converter has also provided you other calculation of pre-sliced vegetables as well as other juice in order to help you positively on preparing meals and cooking. Not only working for fruit juice including lemon, but the Produce Convert apps have also worked for vegetables as well. Thanks to the relatively exact result of how much cooking material you need to prepare, it will help your cooking to become more effective with a relatively exact amount of cooking materials. However, how much juice is in a lemon does not depend totally on the size or the type of the lemon fruit. The amount of the juice in one lemon also depends on the way we tend to extract the lemon juice. In fact, the different way you choose to extract the juice from lemon fruit will result in the different amount of lemon juice you will get. 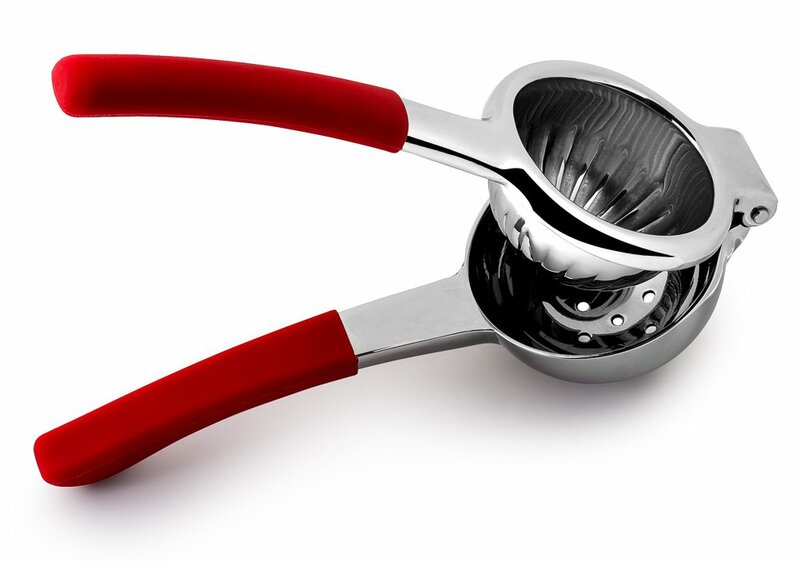 This part will provide you how to juice a lemon effectively to extract the largest amount of lemon juice. You may feel surprised but yes it is, the fork is a secret weapon to help you get almost all of the juice of one lemon. And it is easily found in every kitchen. That is why I really love it, very simple and practical. Firstly, I cut the lemon in half. As I am a right-handed, I hold one of the cut halves in my left hand and a fork in my right hand. Then I insert the fork in the cut half and move the fork back and forth or up and down, at the same time squeeze the half to have lemon extract. See, it is very simple! If you are a left-handed, just switch the fork and the lemon, the movements are the same . The fact that the lemon juice is stored in many little pockets which are separated by thin membrane inside the lemon. To extract juice from lemon or lime, we need to break the all the membrane to open all the little pockets of juice. That is why if you squeeze the lime by your bare hand only, you hardly have all the lemon juice out because not all the pockets are broken. But the fork is an effective tool to help you make it. This is an easy and effective way. 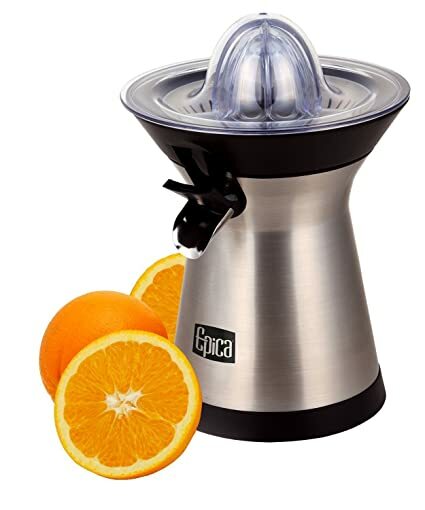 Citrus juicer products are also very diverse, from hand juicer to electronic juicer. This method also gives you almost all of the juice of one lemon. However, it will cost you more money to archive the goal. Indeed, this method is suggested by a lot of famous chefs from all over the world in order to extract the largest amount of juice in one lemon. To obtain the most juice, firstly you cut the lemon into three parts lengthwise. After that, you cut the middle part in another three parts lengthwise. Now, you are having five pieces of lemon in front of you. For the side pieces, you hold them over a bowl and squeeze firmly, one at a time. For the centerpiece, you will need to hold it with both hands to twist and wring out the juice as if you were squeezing all the water out of a wet towel . These are the three most effective ways to extract lemon juice that I would like to recommend to you. In addition to help you get extra juice from a lemon, before start juicing a lemon, let’s roll the lemon on your cutting board or countertop about fifteen times or so, with a bit of pressure on the lime. Or you can also place the lemon in a microwave under the medium heat. Take it out after 10 to 30 seconds and let it cool slightly. These tips help free up the juice and make it easier to get out of the lemon. You will be surprised by how much juice is in a lemon that you extracted this way. However, whatever method you use to juice a lemon, always remember to wash the lemon carefully under the running water to get off any dirt and disease-causing microbes, including E.Coli on the lemon. Watch your eyes. Lemon juice is a highly acidic liquid which can hurt your eyes very much if it splashes in there while you are juicing. For the same reason, if you have any open wound on your hands, please wear some thin plastic gloves to protect them from the lemon’s acid. Wash your hands thoroughly after juicing lemons too, as you may accidentally rub your eyes while some of the juice is still linking on your hands or fingers. From my grandmom, the way to choose lemons together with the way to store them have also impacted on the amount of juice in one lemon. As follow, this part will open to you some secret tips to choose juicy lemons as well as the most efficient ways to store them. If you are looking for juicy lemons, let’s pick the one that is heavier than other lemons with the same size, and with a pleasant scent. Simply hold the same size lemons in your hand and pick the heaviest ones. You should pick the lemon has bright yellow color. The acidity influences the color of the lemon. It also determines the sourness. The darker yellow the color is, the lower acidic the lemon is. So a brighter or greenish yellow lemon is always more acidic than the deep yellow one . You should look for lemons with a smooth and shiny skin with no wrinkles. A lemon with thinner skin contains more juice, while the lemon with thicker skin is a better choice for zest. Surface marks like small blemishes and spots usually do not have any effect on the juice and how much juice is in a lemon. But you should avoid bruised or dried-out lemons. Also, be sure to check that the lemon is not too soft and has no signs of white or green mold. How do I know if a lemon is ripe? As long as it is not rock hard, it is ripe. Also, please keep in mind that lemons ripe very slowly, so it is best to pick them ready to use. However, as we do not buy the lemon for its sweetness, it is no need to concern about this too much . You do not really have to choose the organic ones if what you are looking for is its juice. Because organic lemons always cost you more to buy. If you want to use your lemon for its zest, it can be worth to pay more for organic or unwaxed lemons. Since organic lemons are not treated with fungicide wax, they are much more susceptible to mold. Because of that, you need to be extra careful in choosing organic lemons. Look for white or green spores on the lemons, and check any lemons that are nearby, as mold easily spreads from one fruit to the next. If the lemon or its nearby lemons have those signs, you really should not pick it, despite how cheap it can be. Also, avoid lemons with soft spots . As I mentioned above, the lemons ripe very slowly, so there is no need to keep them in your fridge. They can be stored at room temperature for a week or more, but stay away from the sunlight and moisture. A bowl of lemons will make your house smell sweet. However, if they are organic lemons, then they should be stored in the fridge and should be used within a couple of days . Lemon itself is truly a fruit wonder. Lemon’s scent can be a mental boost, while its juice helps ease a sore throat very effectively. Lemon is also a great home remedy for digestion aids. The antioxidants in its composition help preserve other fruits. For your information, lemon is a rich source of vitamin C and other essential nutrients such as phytochemicals, terpenes, and tannins which work as a cancer prevention and brain booster. You may wonder how much vitamin C is in a lemon. An average 3.5oz lemon contains about 53mg vitamin C. Also, like a citrus fruit, lemon has a significant concentration of citric acid . What about the benefits of lemon water? Can you guess how many calories are in lemon juice that you usually drink? One fl oz of lemon juice contains only 7 calories. Normally a glass of lemon juice is around 8 – 8.5 fl oz will bring you about 56 calories. The number is just so small in comparison to the impressive benefits it brings to your body. Back to when I was a junior in the college, I attended a class of Biophysical of a male professor. And I have to admit that, though he was in his 40s, his look was much younger than the ones in their 30s. His top secret was to bring along a lemon water bottle and drink it every day. Though lemon is not on top of the list of citrus fruits have high vitamin C, it still contains a great amount of vitamin C in comparison to other fruits. An average 3.5oz lemon provides 64% vitamin C of Daily Value, which is a primary antioxidant helps protect cells from damaging free radicals, reduce skin wrinkles, and boost up the immune system . Besides, drinking lemon water frequently keeps your body hydrated. We all know that water is the best drink for hydration. However, many people find it hard to drink just water, adding lemon helps enhance the flavor and make you want to drink more. A lemon water diet also supports weight loss if you are expecting to lose some. Other than vitamin C and citric acid, lemon juice nutrition also includes sodium, potassium, dietary fiber and sugar which helps aid digestion and encourage the production of bile. With all of the benefits listed, let’s start a habit of drinking a glass of lemon juice every day or add a lemon to your diet. It is very simple. Let me show you how to make lemon juice. All you need to do is to squeeze half a lemon into 8 oz of boiled water. To make it more flavor, you can add a few sprigs of mint or a slice of ginger, or a dash of cinnamon, or a teaspoon of maple syrup or raw honey or sugar. You can drink it cold or warm. Warm lemon water benefits you as a comforting alternative to other hot beverages, while cold lemon water benefits you as a refresh and energizing drink . In conclusion, how much juice is in a lemon? A lemon equals two tablespoons of lemon juice (approximately 30ml) and one tablespoon of lemon zest. However, this result may change according to the size of the lemon, how do you extract its juice and how do you store the lemon.